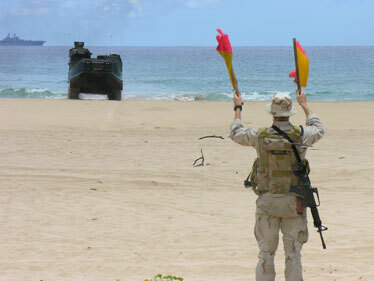 With civilian officials observing, U.S. Marines practice an amphibious assault at Barking Sands on Kauai as part of the RIMPAC exercises. After landing at Major's Bay, this military vehicle became the site of family photographs. MANA, Kauai » The Pacific Missile Range Facility opened its doors to the public yesterday for a glimpse of Kauai's part in the Rim of the Pacific exercises being conducted in and around Hawaii. With about two dozen spectators in attendance, including county and state officials, business leaders and other community members, two amphibious assault vehicles hit the beach at Major's Bay, coming close enough to touch. 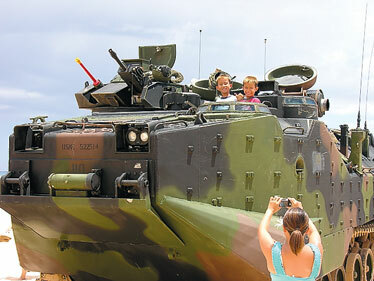 The crowd also got the opportunity to meet the Marines driving the vehicles and climb atop the turrets. The event, which allowed a task force from the 3rd Marine Regiment to practice landing techniques, also gave commanding officers a chance to plan a landing with their counterparts in the Australian navy. An amphibious assault vehicle landed yesterday at Major's Bay on Kauai at the Pacific Missile Range Facility as part of Rim of the Pacific exercises. With the USS Bonhomme Richard and an Australian naval vessel offshore, the amphibious assault vehicles landed on the beach, while another team, made up of Australian, Indonesian and U.S. Marines, was transported via helicopter to the landing strip at the missile range. The teams were scheduled yesterday afternoon to take the amphibious vehicles back to the Australian ship, where they were to spend some time aboard with their allies, said Capt. Rod Clark, commodore of the amphibious assault squadron. "We took (our staffs) and mashed them together (with the Australians) to put a marine assault together," Clark added.